The Benetton of all-natural smoke flavors. Available in all supermarkets, Walmart, Whole Foods, and the Charlestown (RI) Mini-Super, near the Tabasco and Worcestershire sauce, and online. If you want to make your own great “barbecue” at home, you need some liquid smoke. And if you’ve never used liquid smoke, or had a bad experience with it, it’s time to try it (again). Liquid smoke will change your life. I’m a backyard boy scout barbecue guy and liquid smoke changed my life. Fact is, some days I don’t want to fire up the smoker, or don’t have time. Bacon is made with liquid smoke. Lots of liquid smoke. 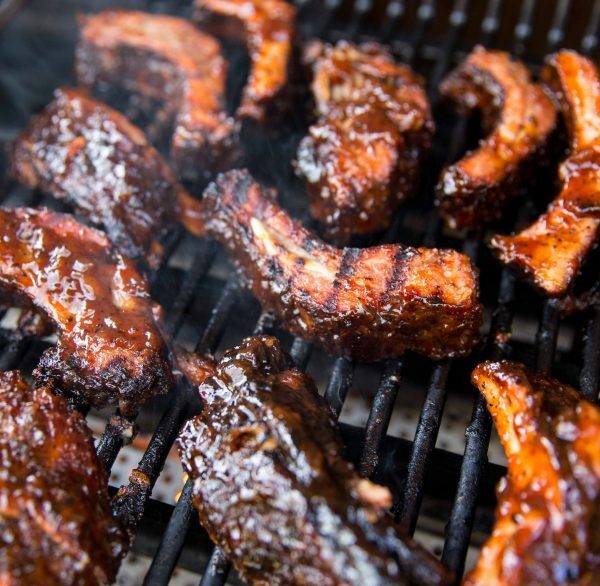 Liquid smoke is a critical ingredient for making great barbecue without a fire. Yes, it gets a bad rap (often from barbecue fanatics who also worship bacon) but after a years of cooking with it we still don’t understand its undeserved reputation as some kind of imposter. Maybe it’s all in the name. Ironically, scores of products boast ‘natural smoke flavor,” they just leave off the “liquid” part. Liquid smoke tastes and smells like real smoke because it is made using real smoke that is condensed in water. Liquid smoke has been accepted by the U.S. Food and Drug Administration since the early 1960s. Just like traditional wood smoke, not only does liquid smoke deliver great wood smoke flavor, it also still performs the age-old job of inhibiting spoilage and reducing pathogens in meats. Liquid smoke filters out the eye burning and coughing carcinogens generated during traditional wood burning. We live in Nashville and have taken some flack for calling our liquid-smoked meats “barbecue.” That’s okay. We like it so much that we wrote a book about it: Cheater BBQ — Barbecue Anywhere, Any Time, in Any Weather (Clarkson Potter 2008). We could spend as much time as it takes to smoke a whole brisket debating the question “what is barbecue?” and never reach a consensus. We’d drink a lot of beer, maybe. But “barbecue” has become a rule-bound, mythical, media-circus concept that often discourages people like you and me from making barbecue at home, how ever we define it. The more popular and cultish it is, the more folks believe they can’t do it themselves (according to my own informal kitchen table research). There are many roads to good barbecue and other smoked foods. Here at Cheater Chef we travel them all, depending on prevailing conditions. Steady, low temperature cooking and smoking takes time, patience, practice, not too unreasonable weather, and a good sense of humor as you ride the learning curve. Sometimes things don’t turn out like Aaron Franklin’s now world-renowned Texas brisket, at least not the first couple of tries. Barbecue also requires a place to set up all the gear. That’s why it’s so big with the guys. Guys like a lot of gear. That’s a lot of conditions for a plate of ribs or smoked pulled pork or chicken. And that’s a shame. 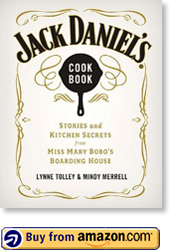 The Cheater Chef mission is to encourage and enable home cooks to tackle anything in the kitchen that interests them, particularly foods that have been hijacked by celebrity (or that require matching red shirts with the dancing pig logo and a trophy room). Barbecue is one of those foods, and liquid smoke solves the problems caused by barbecue’s popularity. Give it a try, and tell me what you think. We hope you’ll take a look at some of our favorite Cheater Chef recipes using liquid smoke. They’re not all barbecue! 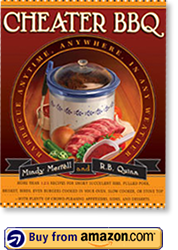 For more about liquid smoke take a look at our page The Straight Scoop About Liquid Smoke here at rbandmindy.com.